I recently finished Simon Sinek’s Start With Why. I didn’t even know about this book despite knowing of his infamous Ted Talk, but when I did hear of this, I was excited to go in-depth on the subject. If you’ve been reading my blog for a while (or probably even recently), you’ll know that I’m a big proponent of being grounded in purpose and why – as an individual and as a company. Leaders and founders utilize WHY to set the vision of the company. Typically, too, the founders are complementary in one providing the WHY while the other enables the HOW. For greatest effect, both must be present. Note: one is not “better” than the other. They’re complementary. We (and companies) are good at espousing the WHAT and HOW we do, but are “fuzzier” on our WHY. 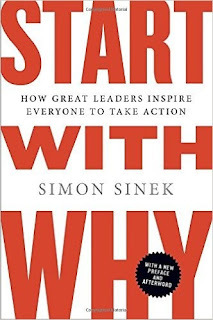 Starting with WHY allows us to build on an emotional pull with our audience – a trust. When we sell on our WHAT and HOW, we differentiate by features, price, etc. Why allows us differentiate on a deeper level – a belief and compelling motive. Our WHAT and HOW aligns to (and amplifies) our WHY. Most companies start with some WHY, and reason for being that was born out of a need and a vision. The challenge, then, for companies is maintaining that WHY. Typically, companies start espousing WHAT rather than grounding into the WHY. It’s a shift in culture – the “split”. Leadership change can have a drastic shift in a company’s culture (and indeed, a shift from WHY to WHAT). Culture is driven top-down. WHY can pull your company through the tough times. WHY creates loyalty amongst “followers” (consumers) who are willing to pay a premium or bear an inferior product. Do not sell a 500GB music player… sell 10,000 songs portable anywhere. I’m definitely not doing Simon justice with this book review, but hopefully, it’s enough to motivate you to check out the book. It’d be great to hear what your personal WHY and PURPOSE are.